Most people have heard the term "starving artist." It's someone who has sacrificed financial security and regular employment to pursue their creative dreams, right? Wrong. 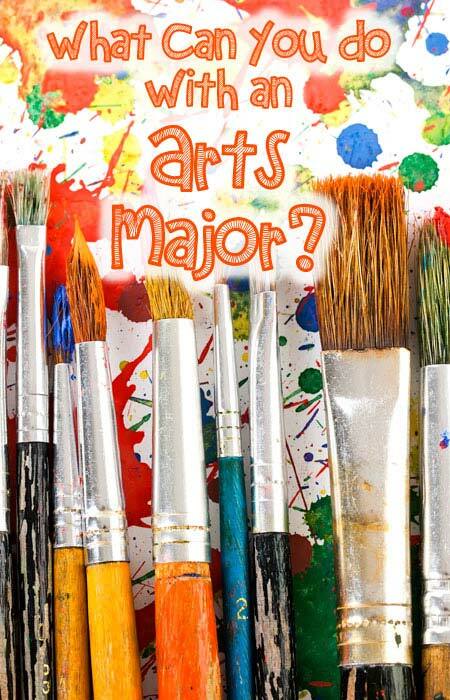 The truth is, there are plenty of jobs to be found for arts majors, no starving required. According to the nonprofit organization Americans for the Arts, the arts and culture industry creates about 4.6 million jobs every year nationwide! 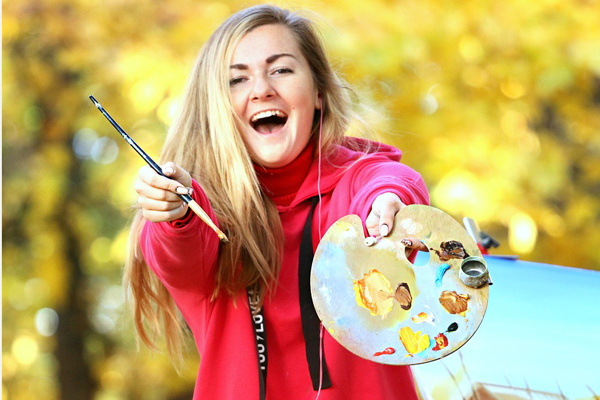 A major in the arts can help you refine your creative abilities, develop a strong work ethic, and learn how to put them to work in the world of business. This combination of creative chops and transferable skills helps arts majors land jobs in fields like book design, advertising, medical illustration, performance—even politics and medicine. Take a look at what these former arts majors did with their degrees. Scheckel found her career on the TV show Law & Order: SVU. In one episode, a child witness wouldn’t talk until an art therapist came to help the detectives. That job was a perfect match for Scheckel because she enjoyed working on art and wanted to help people. She works with children and adults with disabilities. “Art therapy is a way for people to express emotions when they don’t have the words,” Scheckel says. “I work with a lot of clients who have been through something traumatic.” She might ask them to draw self-portraits or pictures showing the pathways of their lives. She usually works on her own projects while clients are doing theirs. The process of creating something often helps them move forward. Cassar was born in Italy to a family of artists. His great grandfather was a sculptor, his grandfather a sculptor and painter, and his mother a ceramic artist. He started out working as a graphic designer before finishing his bachelor’s degree at Rutgers University. Now he organizes teams of designers to finish projects, like a visually stunning annual report for a company’s investors and board members. In college Cassar learned about the history and theory behind design. “You learn way beyond what looks pretty,” he says. “You learn exactly why it looks pretty. I can now understand and fully articulate to my graphic designers exactly what I need.” Outside of the office he creates paintings inspired by his native Sicily and exhibits them alongside his ancestors’ work. Studying the arts doesn’t mean you’ll turn into a starving artist—it actually opens up a wide world of careers. “Artists can have very secure incomes,” says Beatrice Mady, a Fine Arts professor at Saint Peter’s University in New Jersey. “They can lead happy, productive lives." Kilareski wanted to design toys, so he wrote to 10 toy companies and asked what college major would lead to his dream job. About half wrote back, suggesting Industrial Design. After attending the Rhode Island School of Design, Kilareski decided to use his major for a different purpose. Upon graduation, he worked for a company that designed children’s furniture, made technical drawings, and designed industrial products. Now he is responsible for designing and maintaining exhibits at a children’s museum in Pennsylvania. One includes a make-believe corn field where kids pick plastic corn covered with husks Kilareski sewed on. He also found foam that could be cut into parts for kids to assemble toy airplanes. “You have to think like a kid, so you have to think of how a kid’s going to interact with something,” he says. “My mom says I came out of the womb dancing,” Comedy says. Now he’s making a living with the company named after modern dance pioneer José Limón. While working on his dance performance degree, he learned about choreography, rhythm, the history of dance, different styles of dance, and how bones and muscles move. With Limón, Comedy has performed in Italy and China. The company also performs shows in New York City and teaches schoolchildren about dance. Most days start with warm-ups, followed by rehearsals for upcoming shows or learning new or reworked routines. Besides providing an outlet to do what he loves, Comedy says his work with Limón helps him develop as a performer. After the final exam in a community college art history class, Roberts asked her instructor about jobs in the local art scene. She pointed her to the David Klein Gallery, where Roberts still works today. Roberts worked her way up from an entry-level secretarial job to become Assistant Director, doing everything from shipping artwork to designing the gallery website. The gallery focuses on post-war and contemporary works by American artists, but she has also handled original pieces by famous names like Pablo Picasso and Henri Matisse. Her art history classes gave her a deeper appreciation for art, which she shares with clients. Holmes’ résumé includes the video games Halo Wars and Neverwinter Nights, in addition to some animated movies. He says video games offer many opportunities for graphic artists—sometimes as many as 300 people work on a single project—although most projects end after a few years. He works with the games’ writers and designers to get a sense of the story and sketch the background and characters. Other artists fill in the details. “In a video game, nothing exists until you make it,” he says. Holmes uses a lot of what he learned in college, like human anatomy, costume design, and how to develop characters players can identify with. Minor league baseball games are as much about entertainment as the sport itself. During each Richmond Flying Squirrels home game, Wilson is in charge of adding some production value to the bases, keeping fans entertained. “It’s basically a big show every night,” Wilson says. She picks songs for when players step up to bat, makes animated vignettes for the stadium video board, and edits videos of game highlights, later setting them to music for the team website. Wilson wanted to work in entertainment ever since she worked on her high school’s TV announcements, but she preferred being behind the camera. She worked on a similar program in college, and even got class credit for an internship assisting the director of the soap opera Days of Our Lives. She’s glad she also learned skills like photo editing, studio production, and Web design. Danyew’s compositions have been performed on the steps of the United States Capitol and at the Sydney Opera House in Australia. “It’s just an incredible feeling to hear a piece that you wrote realized,” he says. “Whether it’s a high school group down the street from me or the US Coast Guard Band, it’s a thrill to hear your work come to life.” As part of his work, he visits choirs and concert bands that are performing his pieces—in person or by video chat—to explain his creative process and listen to them practice. Danyew also works at the University of Rochester’s music school, managing projects on innovation in music and teaching classes on making a living in the field. Perry shares her love of performance with people every day. For her day job she teaches drama and dance at a private school, where she also directs plays and choreographs musicals performed by elementary, middle, and high school students. She also teaches dance and fitness classes for adults. Perry’s résumé is full of shows she has performed in as a dancer and actress and shows she has directed and choreographed. Before moving to Florida, she was the executive director of a dance company outside of Philadelphia, running the organization and making its ideas happen. On top of her teaching and performance, she’s also working on a doctorate in spirituality and the arts.